A popular club band in the New York/New Jersey area, T.T. 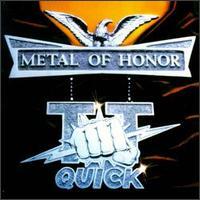 Quick were known for their anthemic power metal laced with flashy guitar work that bordered speed metal at times. 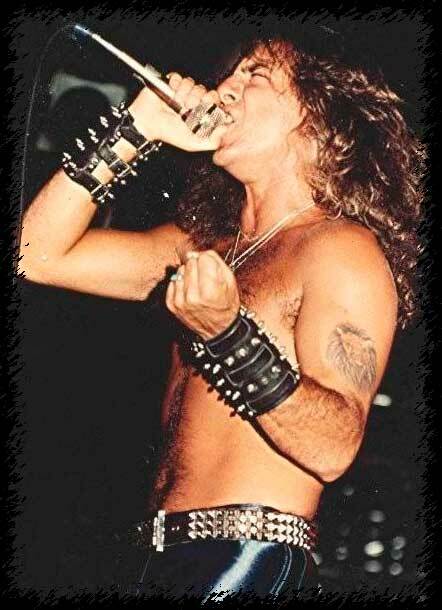 Their debut EP and the powerful "Metal Of Honor" were phenomenal and pointed towards bigger and greater things to come, but the band broke up in 1987 after a mildly successful club tour. The band reunited sporadically over the next decade and released a few albums including a live album from one of their reunion gigs. 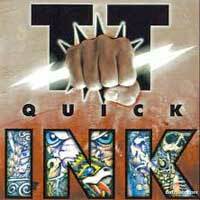 The band has also recently released a new studio disc called "Ink." 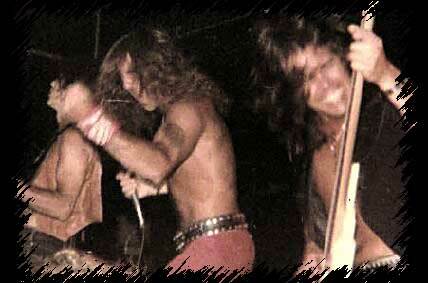 I had the pleasure of seeing these guys in 1983 in a small club in Rochester, NY where they headlined with Helstar as their opening act. 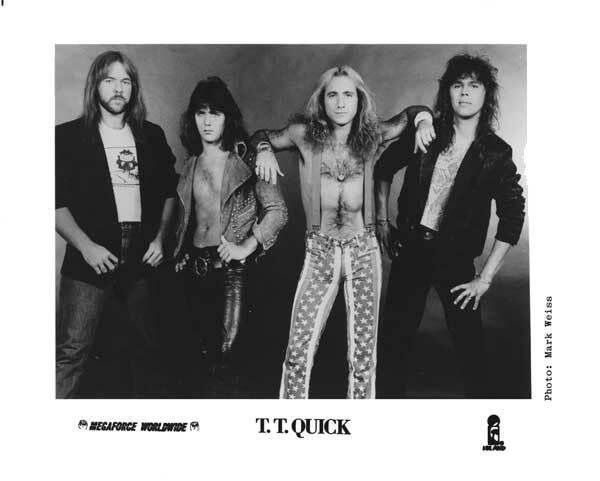 TT Quick's line-up has pretty much stayed the same over the years: Mark Tornillo (vocals), Dave DiPietro (guitars) Walt Fortune (bass) and Erik Ferro who played drums on everything but the first EP. 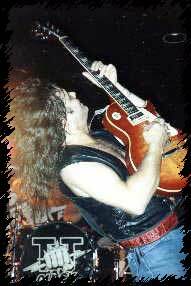 Glenn Evans of Nuclear Assault fame performed on the EP. Dave DiPietro also played a spell with Nuclear Assault. Mark Tornillo began recording and touring with Geman metal legends Accept in 2010. Well, since I couldn't find a CD copy of this, or even a CDR copy, I settled for the original vinyl version. I suppose I never should have gotten rid of it to begin with but I assumed it would eventually make it to CD. WRONG! Anyhow, I love this EP. Every single song, including the Creedence cover rocks! Heavy metal like none other. Pure American Steel! 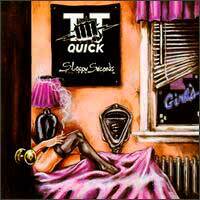 TT Quick were an under appreciated band who just never caught the right break. The line-up for this album is slightly different than the rest of their catalogue and included: Mark Tornillo (vocals), Dave DiPietro (guitars), Walt Fortune (bass) and Glenn Evans (drums) who went on to form Nuclear Assault with ex-Anthrax bassist Danny Lilker. Eventually Dave DiPietro also joined Nuclear Assault. While this album has yet to be released on CD, "Victims" was released on the "Deeper Into the Vaults" compilation. 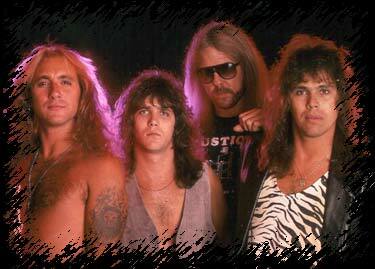 1986 "Metal of Honor" promo photo. Click to enlarge. Got to see TT Quick touring for this album with Helstar opening in a small club in Rochester, NY. Oddly enough, most of the crowd left after Helstar. However, TT Quick came out and put on a great performance for hte handful of fans left over and then came out and partied and shot pool with us afterwards. A memorable concert experience from a great band and a great bunch of guys. I own this one on vinyl and CD. 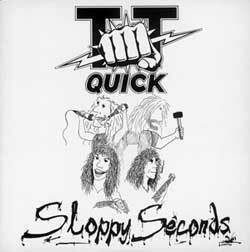 "Sloppy Seconds" original pressing LP. Long interval between studio albums, so one would expect the sound to be different. Well, if you assumed this as I did, you too would be wrong. Actually the band continues in the straight forward heavy metal mode, although it seems to me they may have taken the aggression down a notch. Still the musicianship is excellent and the songs are full of hooks. Most memorable song is probably "Deliver Me" a song the explores the same old TV Preachers theme yet from the angle of someone truly searching for truth rather than from the angle most bands choose. Other faves would be "Isolation Booth" and "Rock You Over." "Isolation Booth" sports a riff that is very similar to Whitesnake's "Ready an' Willing". Overall, this album does not beat "Metal of Honor" or the incredible first EP, but it's still a good heavy metal album nonetheless. A tenth anniversary live album recorded on October 31, 1990 in New Jersey, my stomping grounds from birth til I turned 18. I had actually forgotten that this band was from my neck of the woods until I heard the band introductions where Walt Fortune is introduced as being from Trenton, NJ. Hey, that's where I lived too. Cool. (OK, like anyone cares!) I knew there was a reason that I was into these guys so early on. Anyhow, this live album is a great testimony to T.T. Quick's legacy. Too bad they didn't release more albums over the years as I really think they could have been contenders. Best thing about this disc is finally getting "Metal Man" and "Go for the Throat" on CD, both are spectacular cuts from their debut EP! Man, I wish they would re-release that thing! Also really dig the extended version of "Child of Sin." 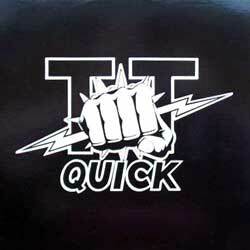 It's the year 2000 and TT Quick are still hanging tough. The nice thing about this band is that they never became a huge success, thus their music continues in the same straight forward heavy meal mode. Had they became "big" I am sure they would have been pressured into changing styles. "Ink" continues in the same style as "Sloppy Seconds" with mostly mid-paced heavy metal tunes and some slight blues influences thrown in to boot. Had to pick up this disc on eBay, as it seems distribution channels for this disc are not very good.